Alt-American: Implausible History, Geography, Science, and Literature of Nineteenth-Century America is a conference about nineteenth-century American cultures that evaded description by the period’s dominant historical, geographic, scientific, and literary institutions, the forms that emerged as alternative to those institutions, and current critical methodologies that embrace and reproduce those implausible histories, etc. ‘Alt’ then refers both to cultural objects described and the systems describing them, both in the nineteenth century and in our contemporary moment. For more information please contact Jason Bell at jason.bell (AT) lincoln.ox.ac.uk. Dates: May 30th and 31st. Location: Ertegun House, 37A St. Giles’, Oxford, OX1 3LD. 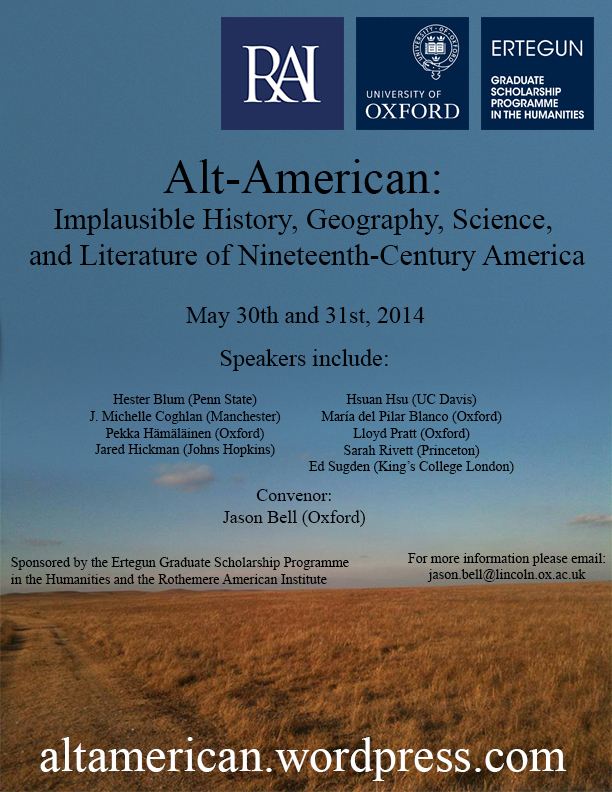 Sponsors: The Ertegun Graduate Scholarship Programme in the Humanities and the Rothermere American Institute.